You see the spirit of Paul here? His heart would not be broken by the fears and the desires of his friends for him to avoid the trouble that would surely come to him. His trust was in the Lord and he was more than willing to be imprisoned for the cause of Christ and not only imprisoned but to die rather than to cower in fear and remain silent. His brothers and sisters saw this and after that they only wished that the will of the Lord be done. How does this apply to the saints in our days? There is a great pressure from the world and from other Christians to remain silent on matters that are tearing not only into the fabric of the world but also into the fabric of the church. People see the foundations are being destroyed and their gut instinct is to flee like a bird to the mountain. Yet the Spirit of God that was in Paul is the same Spirit that is in His saints today. You have this Spirit within you. 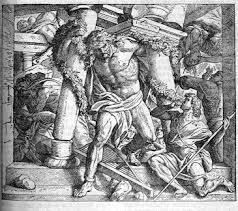 David as indignant for the honor of God and ran towards Goliath. Paul was indignant for the truth and went into the heart of the lion’s den so to speak. The Apostles would not remain silent even when strictly commanded by their own political structures, the Sanhedrin, to never mention the name of Jesus again. Should they obey man or should they obey God? They obeyed God and each paid the ultimate price. Saint, it is very possible you are living in a generation where you to will have to ask yourself the same question, should we obey man or should we obey God. There undoubtedly will be a price to pay for following the narrow path of God in an ever darkening world, a world that is becoming more and more hostile to those who follow Jesus. Yet I am fully persuaded that the only difference between David and Paul and the Apostles and all the wonderful saints down through the ages, who made tremendous sacrifices because of their love for God and His Truth, from you and me is opportunity. What do I mean by that. I mean that in every town and village and city throughout the land, God has His saints and the same Spirit burns in them that has burned in every saint from the beginning of the Church. And in that self-same Spirit we will discover that we are more than conquerors in Christ Jesus. You will already have discovered that in your own personal walk, that in all things you have overcome in Christ. So, do not listen to any fears or voices that would want to make you ” fly like a bird unto the mountains.” We have been called to greater things than that. We have been called to be witnesses to the glory and the truth of he Lord Jesus Christ in what may prove to be the darkest times in the history of man. This entry was posted on June 25, 2015 at 9:30 am	and is filed under A New Breed, anointing, Charisma Magazine, Christian, christian living, Christianity, Church history, church of scotland, churches, Daily devotional, Devotions, end times, inspirational, Jesus, new wineskins, pentecostal, revival, the remnant, the state of the church, theology, Uncategorized. You can follow any responses to this entry through the RSS 2.0 feed. You can leave a response, or trackback from your own site. That would be my idea of it all. I do know the Catholic Church is very evil and changed things a lot. This is why I am somewhat fearful. It may require a study…:) Thanks brother.